Car+Sound proved again to be the most important European trade show for mobile electronics: and within this international showcase of new and exciting technologies, Elettromedia took centre stage. 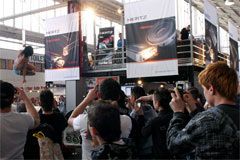 The new Hertz and Audison products featured in Elettromedia’s booth attracted numerous visitors. Enthusiasts and industry personalities from Europe, the USA and Asia were amazed with the introduction of the all new Thesis amplifiers and loudspeakers project: with the enthusiastic comments received, we anticipate great success for these exciting products. On the Elettromedia show floor, 3 demo-cars featuring systems engineered and fabricated by the Elettromedia team were on display: a black Fiat 500 with the new Hertz Energy product range, a Chrysler Grand Voyager with Hertz Mille speakers and four Audison amplifiers and finally, a white Fiat 500 equipped with Hertz components and externally set up for an exciting roof-top dance show which managed to spice up the spirits of the attendees. Elettromedia, who has been part of the EMMA (European Mobile Media Association) network since last year, also participated in the area of sound competitions. During the show, competitors vied for the EMMA European Supercup: 5 international teams challenged one another in a Sound Quality competition using the same system configuration of the same products selected from four top world brands. Audison was chosen as the reference brand for the electronics: the LRx 5.1k for the subwoofer system and tweeter, with the LRx 2.4 for the midrange.